A basic and easy recipe for homemade pasta dough. With this recipe, you can make lasagne sheets, farfalle, ravioli, tagliatelle, pappardelle and so much more. Making pasta at home is not as hard as it may seem and is so worth the extra effort! Place the flour on a clean work surface, make a well in the middle and add the eggs (photo 1). Using a fork whisk the eggs whilst slowly incorporating the flour until combined and looks like a very rough dough (photo 2 & 3). You may need to use your hands once most of the egg is incorporated to help it along. Bring the dough together with your hands to form a ball. Knead the dough for 10 minutes until smooth and pliable. Wrap the dough in cling film and leave to rest for 30 minutes, out of the fridge (photos 4-6). Once the dough is rested it's time to roll it out. Cut the dough in half so it's easier to roll out and flatten it with the palm of your hand so it will fit through the first setting on the pasta machine, usually 0 (photos 7 & 8). Pass the dough through the widest setting once then fold one side over the other as shown on photos 9 and 10. Flatten the dough with the palm of your hand again so it will fit through the widest setting and roll it through again. Repeat this process folding the sides in and passing it through the widest setting four times. Once you've done that pass the dough through each setting once from the widest to the second last setting (number 7). Ok so, lasagne sheets are super simple just roll the pasta dough through the machine until you reach the second last setting (my personal preference) or the very last setting. Cut the lasagne sheets to the right size to fit your dish and you're good to go. If you're looking for a classic lasagne recipe made with a rich ragu and silky creamy bechamel sauce check out my lasagne recipe here. I also have a recipe for a vegetarian lentil ragu lasagna and a butternut squash lasagna that's perfect for fall! Each of the above calls for roughly the same process just different widths. The one exception is that pappardelle (the widest of the three) needs to be cut by hand. Simply fold your lasagna sheet in half over and over again until you reach a 1-inch width (photos 13 & 14). Cut the roll of pasta into 1/2 inch pieces, you can trim the ends if you need to (photo 15). Unravel the pappardelle and use as required. If you're not using straight away shape a few strands at a time into nests to dry out (photo 16). 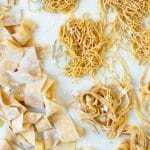 Making tagliatelle and fettuccine are really simple. Place the relevant attachment on your pasta machine (most pasta machines come with this, here's the one I use). Roll the dough through the machine and you'll have tagliatelle or fettuccini (photos 17 & 18). Use the same method and shape the pasta into nests to dry out if you're not using straight away. I very rarely roll my pasta to the very last setting, I find it a little too thin and much harder to work with because it's so delicate. If I'm making ravioli I roll it out to the third last setting, number 7. For lasagne, tagliatelle or pappardelle I roll it out to the second last setting, number 8. The general rule is 1 large egg to every 100g (3.5 oz) of 00' flour. I like to add 1 extra egg yolk to the whole mixture, please note I do not mean an extra egg yolk to every 100g. As an example to make ravioli for 4-6 people I use 3 large eggs, 300g (10.5oz) 00' flour and 1 egg yolk. The eggs must be the highest quality free range eggs you can find. In Italy, they have egg specifically for making pasta called 'Pasta Gialla' yellow dough or yellow pasta. The yolks are bright orange giving the pasta a beautiful yellow colour. Luckily I have found high quality eggs that are free range, delicious and have the perfect yolk to give homemade pasta that perfect colour. Have a search for the best you can find in your area. P.S the size of the egg matters. If you use small or medium sized eggs you will need less flour. Stick to large eggs for the best results using this recipe. Use 00' flour for the best results when making pasta dough from scratch. Use the highest quality free range eggs possible. Knead the dough for no less than 10 minutes. It should be smooth and elastic in texture. If you're unsure cut the dough in half, if there are tiny air bubbles inside the dough it's ready. Make sure to rest the pasta dough for 30 minutes before rolling out. Make sure to lightly sprinkle flour on your work surface when rolling out. Always sprinkle a little flour on the rollers of your pasta machine to stop it sticking.